It couldn't last forever, of course. Dieselisation of the line over Jingpeng Pass was inevitable but the suddeness of the change still came as a bit of a shock. In September 2004, traffic was 100% steam worked but by the time we returned in late November of the same year, many trains were diesel hauled. 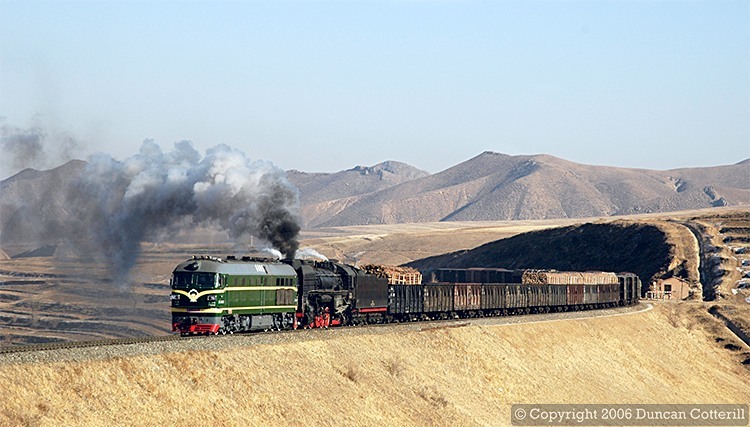 There were also some diesel plus steam combinations, including this westbound freight, hauled by DF4 6005 and QJ 6878, photographed above Liudigou on 2 December 2004.